I’ve tried making Chinese food several times with limited success. Mostly it has been orange chicken, and the results have been “just okay”. I’ve yet to find a recipe for orange chicken that knocks my socks off. 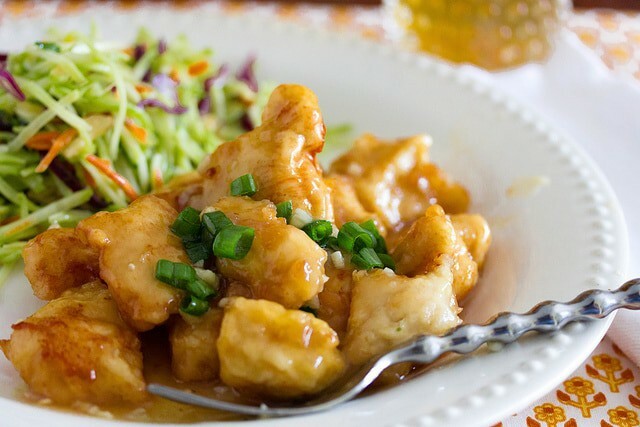 I used to have an amazing recipe for Chinese lemon chicken. I mean years ago, and I lost it. It was really good and pretty easy to make. All that I recall is that it had white vinegar in it and also sugar. It might have been equal parts chicken stock too. It’s all fuzzy now, but I remember that a key part of the recipe was the delicate balance between the sweet and tart. It’s sort of the same story with honey chicken. You probably don’t think much about the tart part when you’re eating it, but let’s face it; it doesn’t taste like candied chicken. That would be kind of disgusting, wouldn’t it? 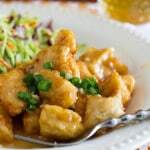 I’ve been searching for a Chinese honey chicken recipe for some time now. After tweaking this recipe just a bit, I’ve found a winner. The batter was spot on as is – very good. The only caution I would throw out to you is that the frying part is a bit time consuming if you don’t own a deep fryer. Otherwise, it’s super easy to make. You’ll notice that I suggest using either chicken breast or chicken thighs to make this dish; I was recently reading that true Chinese cuisine uses the more flavorful dark meat. Truthfully, I’ve never noticed but will try to take note next time we order out. I used breast meat for this dish and it turned out very well. Begin heating oil to about 350 degrees. To make sauce, heat oil in wok and add ginger, garlic, and green onion. Gently pour the slurry into the simmering sauce and continue cooking for a minute to 2 until thickened; do not overcook as the cornstarch will begin to break down after a few minutes. The slurry must be made with cold water. Garnish with green onions (green part) and sesame seeds if desired.